Two plates are lying horizontally, but stacked with one 10.0 cm above the other. If the upper plate is held at +100 V, what is the magnitude and direction of the electric field between the plates if the lower is held at +50.0 V? -50.0 V? This is College Physics Answers with Shaun Dychko. The electric field between these plates is equal to the potential difference between them divided by the separation. 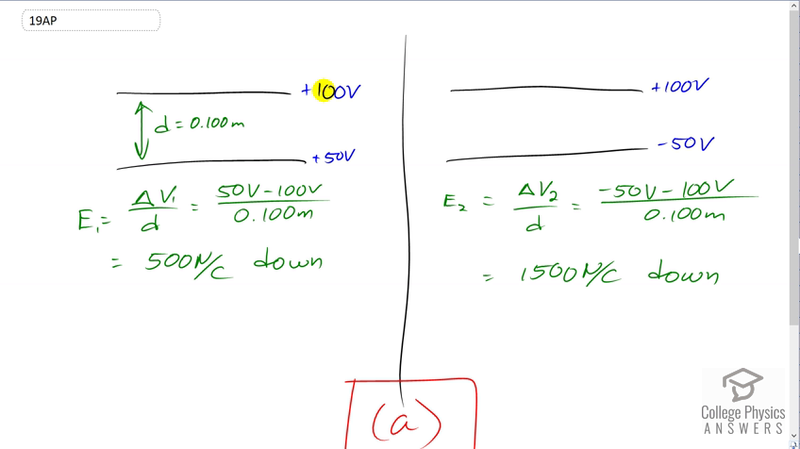 So, the difference in potential is, final potential is 50 volts minus the initial potential of a 100 and that divided by 0.100 meter separating them and this gives 500 newtons per coulomb and you could say its negative 500 but instead of writing the symbol negative, I have written the word down which indicates the same information, it’s a downward electric field, so 500 newtons per coulomb down and case two, where the bottom plate is held at negative 50 volts, the voltage difference is going to be negative 50 volts minus a 100 divided by 0.100 and this is going to end up making 1500 newtons per coulomb down and this is option A in our list of possibilities.